We all want to have our ironing simply disappear. Someone to come and clear up that ever growing pile of cotton, silks and linens would be a dream come true. But not all of us can afford to take our garments to the dry cleaners for a professional press job or hire a maid to do this tedious chore for us. Do we want to fork out extra cash for a top of the line iron, or save our pennies for more enjoyable things? Let’s face it, Ironing is not enjoyable. To make selecting your next cheap iron easier, we’ve ironed out the details for you. Here are the top 5 steam generator irons that will save you money and hopefully a bit of time as well. This little iron is perfect for a single individual that doesn’t have a ton of ironing, and is looking for a cheap iron to get the job done. With its energy efficient 1310W design and 566g lightweight fabrication, it pushes through most creases easily. The soft grip handle is comfortable while using and the easy to use temperature control is nicely placed. 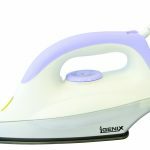 The Igenix IG3120 Dry Iron comes with an auto-cut-out feature that shuts off if left in a horizontal position for over 8 seconds without movement, and after 8 minutes in the vertical position. The stainless steel sole plate is average in size and works quite well gliding over most fabrics. 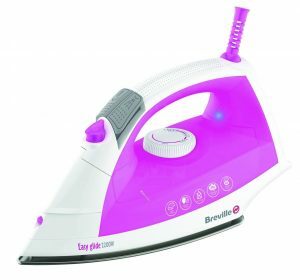 This is an inexpensive iron that will do nominal ironing but doesn’t heat up as much as most irons so clothing that needs a higher temperature while ironing might lose out. 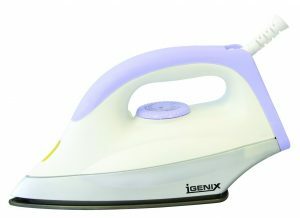 Overall, the Igenix IG3120 Dry Iron is perfect for people with a small range of pieces to iron and also comes with a peace of mind 2-year manufacturers warranty as well. 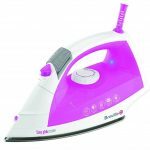 If you are looking for an iron that is simple to use with the basic features needed to tackle your ironing, the Fine Elements Steam Spray Iron might be perfect for you. It comes with the fundamental functions like water, burst and vertical spray/steam and a stainless steel sole plate for easy gliding over your fabrics. With 1400W and weighing only 998g, this iron heats up relatively quickly to save you time and is lightweight in your hand. The grip of the Fine Elements Steam Spray Iron is quite comfortable and the buttons are placed for easy access. One of the added features on this plain jane iron is the 360-degree swivel cord. This little extra feature makes ironing in the most difficult spots a little easier. All in all, not a bad iron and it will get the job done, if the job isn’t huge at least. The Fine Elements Steam Spray Iron even comes with a small water cup for easy filling of the water tank. Perfect for a bachelor on the go! Looking for an iron that has a little more vivacity? The Elgento E22002 Steam Iron comes is great choice with its 2000W and feathery weight of 898g. It has 2 steam settings and boasts a 15g/min continuous steam and 50g/min steam burst output. The aluminum non-stick sole plate glides over clothing with ease and the easy to read temperature dial has enough settings for any job. Each setting is well marked with icons to match your garments. The Elgento E22002 Steam Iron comes with a 1.8m cord that is a little on the short side but is adequate. With a small water reservoir of only 150ml, that isn’t easy to read, you will be filling up more frequently than you may like. The Elgento E22002 Steam Iron isn’t filled with bells and whistles, but it is a decent purchase for a cheap iron. This amazing 1.2kg, 2300w iron could have been number one on the list. It is packed with all of the necessary features and some great additional ones as well. Gliding over any fabric is effortless with the ceramic coated sole plate. With a 330ml water tank, you’ll be able to get through quite a bit of ironing thanks to the water spray and steam features. The temperature control dial on the Ovation HT300 Multi-Function Steam Iron is easy to read and a cinch to use with temperatures for all of your garments. 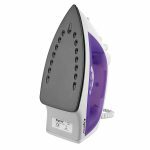 With an iron ready indicator and a 360-degree swivel cord, you will know when your iron is at the correct temp and maneuver easily around every button, pleat, and collar. 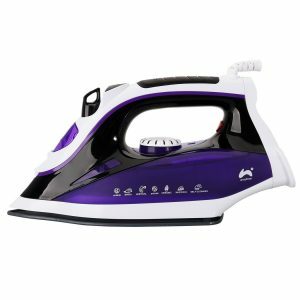 This inexpensive iron also has a built in filter and a self-clean feature that rid your iron of calcium and lime build up with a push of a button. With a 3-year manufacturers warranty, if any issues arise, you are covered. You may have to get used to the strange placement of the cord coming out of the top instead of at the base, and the fact the water level mark isn’t easy to see, but in total, this iron will do the trick and save you money. This cheap heavy hitter has almost all the features you will need in an iron. With 2200W, the Breville EasyGlide VIN207 heats up quickly and evenly. Its stainless steel plate is fairly common but still, glides well over any fibers. What this iron has is power! With 35g of constant steam or an option of an 80g steam shot, you’ll be able to get the little and large creases out of your clothing quite easily. It also comes with a handy vertical steam feature so you can steam items on hangers and things around the house like those drapes! This iron boasts one of the largest water reservoirs in the category at 300ml so you aren’t going to have to refill as often as the rest of the list. The design is ergonomic and although it is heavier than the above-mentioned irons (weighing 1.4kg) that extra weight helps with the ironing. The Breville Easy Glide comes standard with anti-drip so, at lower temperatures, you won’t have to worry about those awful water spots. An easy to use self-clean feature enables you to get rid of any lime or calcium buildup and that will lengthen the lifespan of your new iron. A 2m cord allows for better maneuverability and the option to iron almost anywhere in your home. The only downside is that the sole plate is a smidgeon smaller than some conventional irons out there. 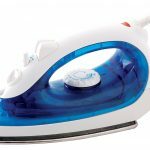 What you need to look at when buying an inexpensive steam generator iron are items that make ironing easy. 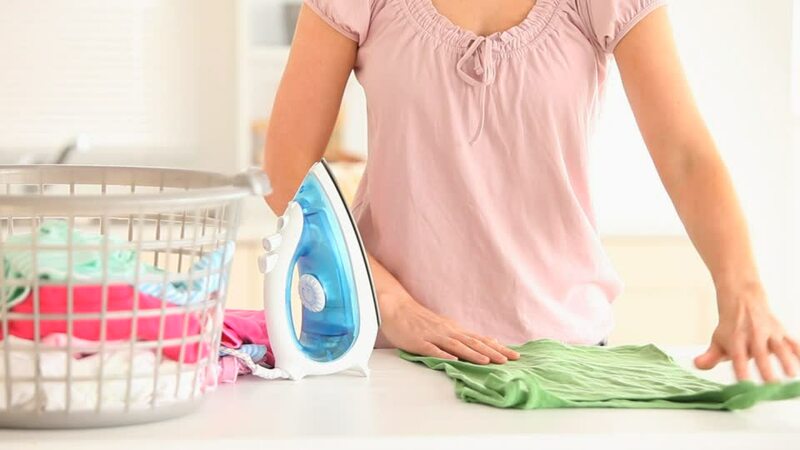 There are a few key features that will help complete your ironing chores and get rid of those wretched wrinkles. We have listed your regular everyday details as well as a few features that make a difference in the overall function of your next iron. Wattage- the higher the wattage, the quicker an iron will usually heat up. Look for steam generator irons with at least 2000w, unless you are looking for something that boasts being energy efficient. Grams per minute steam power and steam options. The higher the grams per minute, the more steam you will have while ironing. 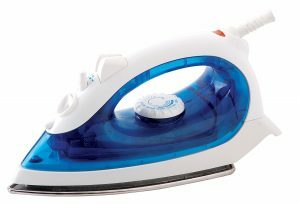 Look for an iron with continuous steam, burst steam and vertical steam functions. The continuous is used for regular creases, burst for stubborn creases and vertical for hanging items or drapes. Non-stick sole plates – unless you want holes in your garments, make sure that the iron you are purchasing has a non-stick sole plate. These come in a variety of materials and will enable your iron to glide with ease over any fiber. Variable temperature settings – If an iron doesn’t have morethan2 settings, some of your clothing is going to suffer. A plus is having an auto temp ready indicator. You’ll know when your iron has reached the proper temperature. Keep these items in mind the next time you want to purchase a cheap usable iron. 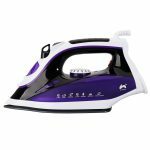 Whether you select a Breville Easy glide Vin207 Steam iron or one of the other good quality, cheap irons on the list, make sure you get the iron that is going to fit your needs the best. Yes, you will give up some higher end features like anti drip, self clean or grams per minute steam power, but there are many inexpensive options out there that come with all the necessary features to get you through one of life’s most mundane chores. Happy Ironing!